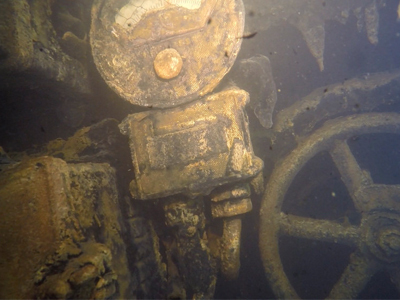 An underwater image of the AE2 wreckage. Photo courtesy of the Department of Veterens' Affairs. More than 99 years after it was scuttled in the First World War, a project to record, preserve and tell the story of the wreck of Australian submarine HMAS AE2, laying at the bottom of Turkey's Sea of Marmara, is underway, Minister for Veterans' Affairs Senator the Hon. Michael Ronaldson announced today. “The AE2 is one of the last untouched Gallipoli battlefield sites and, with the dedicated work of a team of Australian submariners, scientists from the Defence Science and Technology Organisation (DSTO) and US Remotely Operated Vehicle designers, SeaBotix, she will be protected and preserved on the sea floor for many years to come,” Senator Ronaldson said. Project ‘Silent ANZAC’ is a joint Australian and Turkish initiative, led by a team from the AE2 Commemorative Foundation (AE2CF) and Submarine Institute of Australia. The team comprises 16 Australians, 19 Turks and 2 Americans including scientists, divers, academics, maritime archaeologists, film makers, submariners and historians all working together. Assistant Minister for Defence, Stuart Robert MP said the DSTO had contributed significantly to the documenting and protection of the AE2. “The Defence Science and Technology Organisation has developed new and novel solutions to support the current expedition, including a high-definition camera and sophisticated lighting system. It has also installed a protection system around the wreck to control corrosion and a marker buoy to protect it from shipping traffic, anchors and fishing nets,” Mr Robert said. Senator Ronaldson said the project also extended to the development of an education resource for primary and secondary school students – available online at http://ae2.org.au/ – ensuring the AE2 story is available to younger generations of Australians. Project leader and Chair of the AE2 Commemorative Foundation, Rear Admiral Peter Briggs AO CSC (Ret’d) said the roving camera used to inspect the wreck has captured the entire length of the submarine; her forward and aft hydroplanes, rudder and tops of her propellers. “The submarine is in amazingly good condition, original paint, signalman's sand shoes (plimsolls) still stowed in the flag locker in the conning tower along with the flags and what we believe was the battle ensign used by Lieutenant Commander, Henry ‘Dacre’ Stoker, DSO, 99 years ago,” he said. “The Turkish Government will ensure ongoing maintenance of the buoy laid over AE2 – to protect her from further damage – acknowledging the importance of preserving this shared piece of Turkey and Australia’s maritime military heritage." RADM Briggs said one of the most significant discoveries of the exercise was a portable Wireless Telegraph pole and antenna wire, the existence of which had long been the subject of discussion of military historians. “It is most likely that it was this telegraph which transmitted the message to Army headquarters that AE2 had torpedoed an Ottoman gunboat at Çanakkale,” he said. The AE2 entered the Dardanelles at 2:30 am on the morning of 25 April 1915. After torpedoing the Ottoman gunboat Peykisevket, the AE2 negotiated through the Narrows, pursued by surface vessels and passing through the perilous minefield she entered the Sea of Marmara on 26 April. The AE2 was the first Allied warship to make it through the Narrows. AE2’s mission was to “run amok” and torpedo transports bringing Ottoman reinforcements to the Gallipoli battlefields. On 30 April 2015 AE2 was attacked by an Ottoman torpedo boat Sultanhisar, hit by gunfire and scuttled by her commanding officer, Lieutenant Commander Stoker. All AE2’s crew were rescued by the crew of the Sultanhisar as the submarine slid silently to the sea floor. The Silent ANZAC project is an initiative of the Anzac Centenary Program 2014-2018, funded by the Australian Government Department of Veterans’ Affairs in partnership with the Turkish Government Ministry of Culture and Tourism and the Turkish Ministry of Foreign Affairs. Footage of the AE2 is available for download at https://vimeo.com/98684431 (password: Stoker). Selected images are available on the Department of Veterans’ Affairs Flickr page at www.flickr.com/photos/dvaaus. A factsheet on the project is available at www.dva.gov.au/media or visit www.ae2.org.au.